The item False wall, Veronica Heley, (electronic resource) represents a specific, individual, material embodiment of a distinct intellectual or artistic creation found in Richland Library. 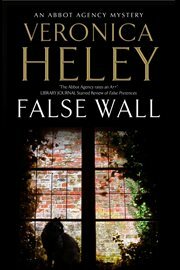 Bea Abbot discovers that at least one of her neighbours is hiding a shocking secret in the latest intriguing Abbot Agency mystery When the party wall dividing the gardens of Bea Abbot and her fianc ÌLeon collapses, amongst the ensuing chaos a human skeleton is unearthed in Leon's garden. Having only just purchased the property, Leon and Bea set out to discover more about the house's previous owners. Before they can proceed in their investigation however, the pair fall victim to an elaborately-laid trap. With her home, livelihood and the agency under threat, Bea appears to be the subject of a meticulously-planned vendetta. But why? And why is Leon becoming strangely distant?